Sunday the 27 November the Dutch Society for Forgotten Vegetables organized a wine and vegetable-tasting at their farm in Beesel, Limburg. The owner of this farm, Jac Nijskens, dedicates his life to growing about 250 kinds of heirloom vegetable varieties, vegetables that are “forgotten” today, the vegetables that you cannot buy at the supermarket and the vegetables that (almost) no-one knows how to cook anymore. 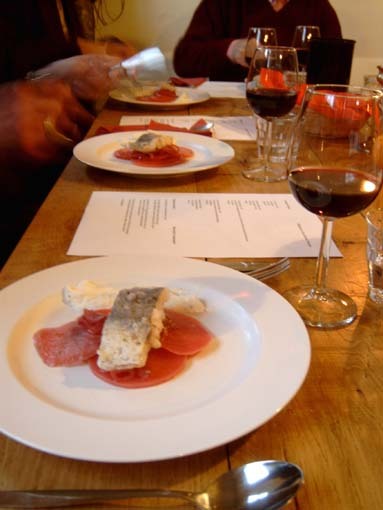 In collaboration with a local wine merchant he devised a menu of 5 small courses, each course was accompanied by an unusual wine. About 50 of us spent 4 hours eating and drinking in the large farm kitchen, while it was slowly getting dark and wet snow was falling outside. 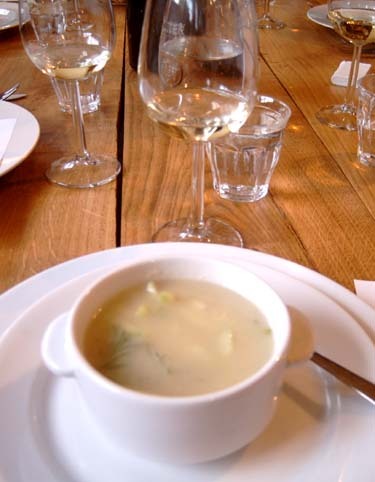 a creamy Jerusalem Artichoke soup, with cucumber, salmon and dill. Pumpkinsoup with cream, and a little slice of pate with a sweet pumpkin chutney. There was a hint of vanilla in the chutney and they chose the wine to match this: Rondan Crianza 2001, from Rioja, Spain, made from the grape Viura. While pumpkin is not really a forgotten vegetable, it is (for most Dutch people) an unusual one. It has become more popular in recent years though. It tastes sweeter than ordinary beetroot, and a bit less earthy. 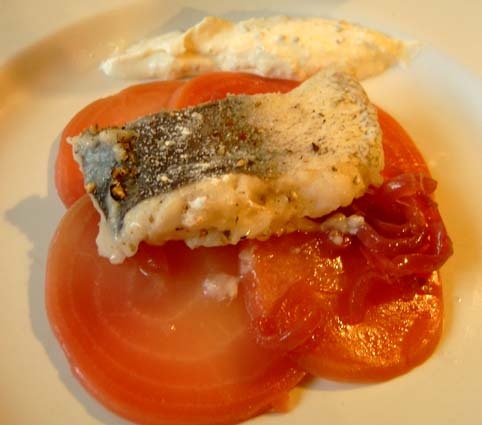 A lovely combination with the fish and the horseradish. With that, a wine that was very unusual and I have to say, not many at our table were very enhousiastic about it. Tellus Reserva 1997, Douro, Portugal. Made from 5 different grapes: Touringa francesa, tinta roriz, tinta amarela, tinta carvalha and tinta barocca. This was a very robust and almost a bit harsh wine. 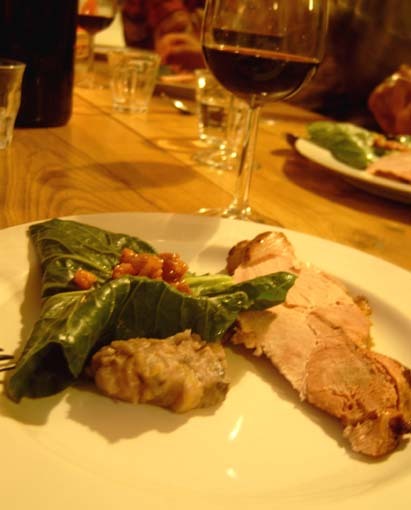 We all agreed though that it improved a lot when drunk with the food, and I felt it combined well with the bold sweet-sour flavours of the beetroot dish. 4th course, a medieval cabbage variety wrapped around a filling of Vitelotte Noir potatoes, yellow carrot from Limburg, and cheese. Served with crispy bacon and a slice of ham. Wine: Dom Pichard Barrique 1995, Madiran, France. Grapes: tannat, bouchy, cab sauvignon. Another bold and rustic wine that went very well with the pork and cabbage. Dessert: not exactly a forgotten vegetable, but definitely a very oldfashioned flavor: Lavender Icecream. 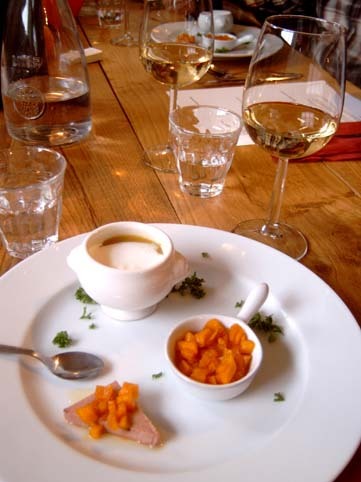 Served with a delicious sweet wine from Corsica: Muscat Felix Pietri. This farm is unfortunately about a 2 hours drive by car from Amsterdam, otherwise I would probably go here every Saturday and beg for some strange carrots or cabbages to take home! Their website is Dutch only, but if you click on the word Plantenlijst in the menu on the left, you get a complete list (with pictures) of all the vegetables he's growing, from earth almonds to mountain spinach. This is wonderful! That beet is beautful, and I'd love to know more about the "medieval variety of cabbage". I wish more farmers were growing these out-of-favor veggies, and making them available to the general public. I was very fortunate on one visit to my favorite French restaurant here in Seattle: the chef happened upon skirrets from one of his vendors, and knowing that I was coming to the restaurant and would appreciate them, he bought enough to make me a small side dish. It was an incredibly thoughful touch, and a cool opportunity for me, because while I had read about them & seen historical recipes calling for them, I'd never actualy tasted skirrets before that moment. On their website it says that the english translation for the cabbage is Fodderkale, but googling only brings up that particular site! So maybe that's not an english word after all? Fortunately, there are many farmers now growing these kinds of vegetables in the Netherlands, but I think this farm is unique for the scale on which they are doing it, and their passionate dedication. I see in their list that they grow skirret as well!! He calls it sugarcarrot and says it tastes a bit like parsnip, but sweeter. I can get cardoons at my Turkish market, but I've never tried them. I think it's time I did.. Fodder kale is two words, that's probably why your googling didn't come up. What it is used for is an alternative grazing crop. University of Massachusetts publication on such things. The owner of this farm, Jac Nijskens, dedicates his life to growing about 250 kinds of heirloom vegetable varieties, vegetables that are “forgotten” today, the vegetables that you cannot buy at the supermarket and the vegetables that (almost) no-one knows how to cook anymore. The Society has the right idea! People are far more likely to try unfamiliar ingredients, such as unusual vegetables, if they know what the vegetables will taste like, and if they are given ideas on how to prepare them. 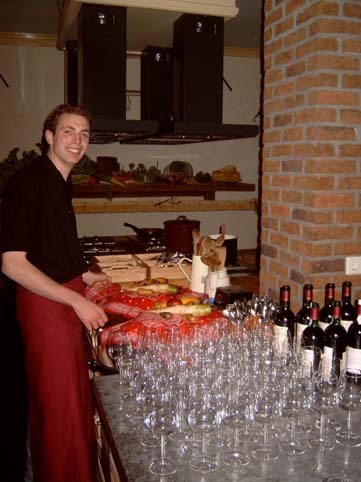 Were recipes made available for the dishes that you had at the dinner? 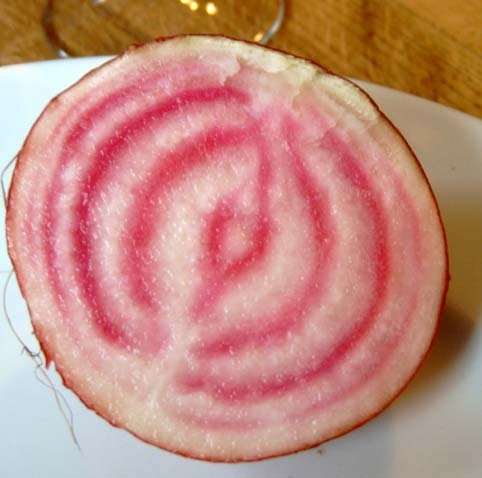 Eden, you might be able to find the Chioggia beet at your local farmers market. The seeds are found in just about every seed catalog in the U.S., so I wouldn't be surprised if the beets were being grown for market somewhere. You can often get chiogga beets at Whole Foods. If I had to pick a forgotten vegetable, I think it would be kohlrabi. There are so many forgotten vegetables out there, If I had to pick a couple I would say parsely root and salsify. Parsely root is a parsely subspecies grown for its parsnip colored root and used mostly in Europe. It has a firm texture and a flavor that is like a mix of parsely (no kidding), carrot, and celery root. I always add it to my chicken soup. I have only been able to find it with regularity in the past couple of years here in Manhattan. Another forgotten one, but that is showing up more in restaurants is salsify, a root that is a member of the sunflower family that when cooked tastes somewhat similar to an artichoke, I think its delicious. You can steam or saute it. I imagine that the medieval cabbage is very similar to collared greens or (or just "greens" or "green cabbage in scotland"). I guess the medieval period went on for longer in some parts. Many fodder crops that are rehected by the upwardly mobile are still consumed by people, the swede ("Neep") in Scotland for instance. There are a few different types of salsify, the most common are called white (Tragopogon porrifolius and balck (Scorzonera hispanica[i/]) salsify respectively. They taste similar. The forgotton veg I would like to taste is the Skirret (Sium sisarum), this was very popular in the 17th and 18th century, but seems to have been replaced by improved forms of the parsnip (which has a similar flavour). Its major fault is that like un-improved carrots and parsnips, the central core is tough and fibrous . Scorzonera. Often seen in seed catalogues, but never grown. Is it possible that many of the vegetables in question have been "forgotten" (a) only in certain geographical regions or (b) specifically among some social groups that consider them too much "the food of peasants" to decorate their own tables? I smiled as I read the piece because every one of these ingredients can be found at either the souk (or if you prefer shuk) of Machane Yehuda in Jerusalem or the Carmel Market in Tel Aviv. Unfortunately, I don't have a garden. Otherwise I would grow them all at least once. I am planning to go back there one day and take pictures of the farm, that was just not possible on Sunday, the weather was so bad! I agree that certain vegetables have only been forgotten in certain regions. I think that in the countryside, many people have always grown (and eaten) many of them. But the past years there seems to be renewed interest in these oldfashioned vegetables: high end restaurants are using them, and many of these vegetables I can buy at my market in Amsterdam when I spend some time and energy to find them: parsnips, scorzonera, jerusalem artichoke, cardoons, kohlrabi. But the chiogga beetroot, heirloom tomato varieties, the black potato I had sunday, the yellow carrot, the medieval cabbage, and many other ' weird' vegetables as listed on the farm's website, would be impossible to track down. They are simply not grown commercially. Oddly enough, it is though to be the Dutch that are responsible for the dominance of the orange carrot in the market. Sainsburys in the UK sporadicaly sells purple carrots, which are quite funa s they maintain there colour upon cooking. Oddly enough, it is though to be the Dutch that are responsible for the dominance of the orange carrot in the market. would that have anything to do with the fact that orange is our national color (and also the colour of our royal family)? Yep. One wonders what colour carrots would have been if Luther hadn't nailed his notice to the door. n.b. I wonder what you called red headed people before the 16th century? Most like they were just burnt at the stake, maybe. celeriac is another one of my favourite old roots [it's very common now though]. it often replaces potatoes whenever i make a mash. parsnips are probably my favourite of all. i don't even eat carrots anymore and i love carrots....parsnips are much better! I was thinking the same thing about geographical regions and rarity or being 'forgotten'. Kohl rabi, for example, which was mentioned upthread as a forgotten vegetable, is very very common here in Germany, and bought by people who wouldn't dream of buying something as 'exotic' as aubergine/eggplant. Pointed cabbage (Spitzkohl) is also extremely common (available, like kohl rabi, even in the cheapest we-stock-generic-brands-only supermarkets), but its not something I had ever actually seen before moving to Germany. Scorzonera is also common. By contrast, trying to track down parsnip or Jerusalem artichoke is a major task. Cookbooks which mention parsnip invariably include a paragraph describing what it is for the benefit of the reader, who is presumed never to have seen one. I'm not sure that the issue of 'social groups' or 'peasant food' is paramount in foods being forgotten or falling out of common use. There can be many different reasons. As a case in point, I had wondered vaguely about why I had not seen even a single Jerusalem artichoke since moving to Germany, but found out the reason only the other day. According to a book I was reading about historical East German foods, they were widely promoted and grown in the immediate post-war years throughout Germany. For a few years they were the most widespread vegetable available. The post war years (not only in Germany of course) were associated with extreme hardship, lack of food, lack of adequate housing as so much had been bombed, as well as lack of warmth as the winters were unusually cold in those years and all possible sources of fuel had long since been consumed. Jerusalem artichokes allegedly became closely associated with the unpleasantness of those years. Marketing them would probably require a very intense campaign to change their image, or it would require a few more decades until a new generation of potential consumers is on the scene. The same associations with poverty and hardship (rather than 'peasant food') meant that, when we were living in a small village in southern Germany before moving to Berlin, my neighbours expressed horror when they saw me harvesting nettle tips or even the numerous blackberries that were to be had in the forest nearby. This had traditionally been one of the poorest regions of Germany (as an indicator of its past poverty, I recall reading in the newspaper while living there that, unlike other regions, it was almost impossible for museums to get hold of the traditional clothing of the region. All clothes had been worn until they fell apart). Most older people, when younger, had been obliged to eat nettles and other foods gathered from the forest because they had no choice. Now they would do without (in the case of nettles) or buy at exorbitant prices (blackberries) what could be had for free only 5 minutes walk away from their homes. The unhappy memories of going to the forest and harvesting those foods were just too strong for people to be willing to do that. And of course, there are also many other reasons why foods disappear that have nothing to do with looking down on something as peasant food. Changing agricultural demands can be one. A slightly different process is occurring right now in India. Bathua (a leafy green that is a type of chenopodia I believe) traditionally grew among and to the side of mustard crops. Both bathua and mustard are harvested as winter greens. However, as modern 'rational' agricultural practices are being adopted, the co-existance of bathua (which has greater nutritional value than mustard) with mustard is now less accepted and instead the bathua is being treated as a weed. Although still available, it is apparently in gradual decline. It is a host plant for one of the stages of stem rust, so once this was recognised it was eradicated from much of its Europen (and American) range. Althouh, some species are now a common garden plant in the UK. You can buy the dried fruit from middle-eastern stores as they are commonly used in Iranian cooking. It was very common in 16-18th century English cookbooks, used as a souring agent and becasue of it's colour. I need only to glance at my garden to see many forgotten vegetables- if you could call them that. Daylilies. All parts are edible at their various stages of growth though the leaves don't do much for me in terms of flavor. Fry the buds or newly opened flowers like you would a squash blossom. Add them to salads or dry them for future use. The tubers can be harvested year round and steamed, served with butter. Cattails. The pollen adds a fantastic yellow color to baked goods. The dormant/young shoots can be steamed as you would asparagus or added to salads. And since the central core of the rootstock is quite starchy, treat it as you would a potato. And my lovely dahlias (well, they *were* before the temps dropped). The petals can be used like most edible flowers and the tubers can be steamed, boiled, mashed etc. I've heard of that one can make a syrup from them but haven't tried it. Hm. 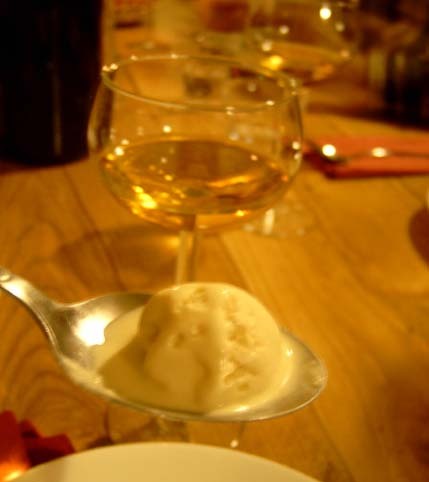 Dahlia syrup over ice-cream? Maybe use the syrup in an Italian soda? The "weeds" alone can be quite tasty. Um. Not that I have them. Such as poke, milkweed, pigweed, dandelions, japanese knotweed, chicory and purslane. A day of weeding in my garden can produce wonderful salads, stir-fries, teas, broths etc. Yet some of these "forgotten" vegetables require two baths (or more) in boiling water to remove their bitterness and careful, often tedious trimming and scraping. Perhaps this "work" was/is a turn-off to many, thereby allowing them to handily "forget" that they were ever edible to begin with. The truly forgotten vegetable I'd like to try is the relative of garlic that was a staple of Roman cooking. Unfortunately, they were apparently never able to raise it commercially, and it supposedly became extinct due to overharvesting. Allium, or something like that. I wonder if it's Field Garlic (allium vineale) that you're thinking of. I hear it's incredibly strong stuff that grazing cows are quite fond of. Garlic flavored milk with your cereal, perhaps? "Allium" is Latin for "garlic", so you would need more information to identify it. The over harvested until it went extinct in the wild sounds more like silphion/silphium/laserpitium which is an extinct form of ferula (giant fennel). I read about this in a Roman cookbook a few years back. When I get home, I'll look it up and post what they actually said, because I'm not sure I'm remembering accurately. As I understand it, the romans ended up replacing the sylvium/silphium with asafoetida in their cooking, but considered it inferior. Yes indeed "forgotten" foods are frequently just a regional phenomenon. I grew up in California eating loquats off the trees in my neighborhood, but here in Seattle, nobody had even heard of them & I was beginning to think I'd imagined their existance, when I came across some in a market in Italy. The vendor thought I was a lunatic because I was so excited, but it was wonderful to taste that tropically-apricoty flavor again after SOOO long. Allium has lots and lots of species; the edible onion, leek, garlic and shallots are just a couple examples. But you can overharvest wild bulbs; the tassel hyacinth is harvested heavily in Greece, where it is made into an very bitter pickle, and has nearly disappeared from many areas where it was once common. The Kurds in eastern Turkey use a wild allium species (which I've never seen fresh) to make an intensely garlicky/oniony flavored cheese that shows up at pretty much every meal. Celeriac would have to be high on my list of half-forgotten vegetables. It's used a lot here in many different ways, my favorite being the "olive oil" version, served cold. Yummmmmmmm. Interesting that one reader wrote that he could find cardoons at a local Turkish market; I've never seen them offered in any market here, but would love to. In Persian they are called "kangar," but the word "kenger" in Turkish refers to a different thistle-like plant, which they dig and harvest a white gum from the roots. It's Anatolian chewing gum. Loquats - wonderful if you can get good ones; they are among the first fruits of spring/summer here. Lots of them seem to come out watery and tasteless. My tree back in Seattle never fruited. You can make a very good Amaretto-like liquer from the seeds (dry them for a couple weeks in the sun, then soak in alcohol for a couple months with a strip of lemon peel, strain, sweeten with 2/1 sugar syrup and then let it sit and mellow for a long time, because before it mellows, it smells a bit like paint thinner... But after a year it is really nice.